Bikes can be seen all over Wichita. . From the growing number of athletic riders, to the Bike Share ICT racks located all over town. 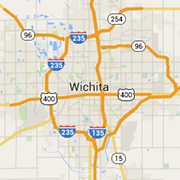 Bikes are becoming a common sight along Wichita’s roads. Wichitans, notorious for their bad driving, need just a few pointers so they can cut out the whole hitting cyclists thing that they are getting good at. Here are some tips for drivers, pedestrians, and cyclists alike. Give Bikes 3 FEET OF SPACE, seriously, it’s kind of the law! Stay out of bike lanes when turning as much as possible. Be aware of everything on the road with you. Don’t text and drive, that one is illegal anyways. Most of these bike paths would make for a great walk or hike. Be observant listen for a possible cyclist to let you know they are passing. Dogs on leashes people! Keep Fido, yourself, and others safe. Wear a helmet - This is obvious to protect your head. Need we say more? Have proper reflective materials and lights. Legally after dark you must have a rear red light and a clear front light. These aren't a bad idea any other time either. Yield to pedestrians and walk the bike in congested areas and obey normal traffic laws. Be predictable when riding on the street. Use bike lanes, and stay a safe distance from the edge just in case some distracted driver does push you out of the way. If you are feeling adventurous check out the local mountain bike trails, Air Capital Single Track, or Sante Fe Lake Trails. For all you budding cyclist and hikers out there check out this awesome map from our friends at Bike Walk Wichita, as well as some fun local riding groups. For those of you looking to get a little more adventurous check out, and possibly join Kansas SingleTrack Society, all money from memberships goes back to maintaining the trail systems utilized by hikers and mountain bikers. If you are looking to make some friends check out the Bicycle Exchange Urban Exploration ride on Monday’s. Don’t own a bike? Check out Bike Share ICT to get started seeing Wichita by bike!